I open the bedroom door. The warm air is leading me out to the balcony. 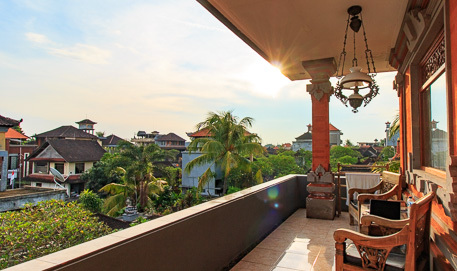 It is on the top floor of the building, overlooking the beautiful and lush greenery of Ubud, right in the heart of Bali. Over to the right I can just glance the Monkey Forrest over the rooftops. To the left the sun has already risen, and the big lukewarm tiles of the balcony are welcoming my newly awakened feet. And I am just standing there. Feeling the warm air on my skin. Some memories will never fade. 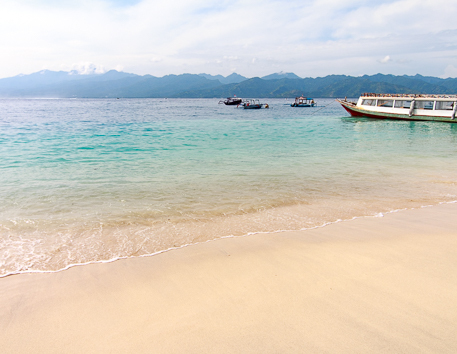 And I have Bali to thank for some of my favorite ones. So, do I miss it? Well, my experience from big travels so far is that the best part of the trip is usually the bit before you go. Because at that point everything is exactly as you imagine it. The beaches are perfect. The adventure is perfect. And all the expectations are still to be met, which means that you have a track record of zero disappointment. So, the short answer is that I miss the sun. And the sense of just being close to nature. 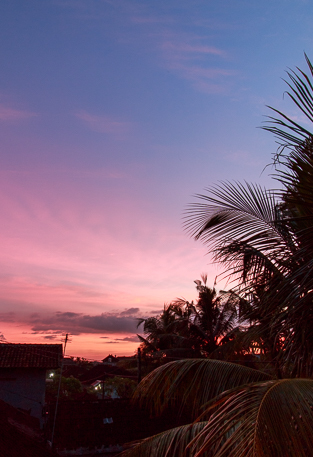 And look at this purple sunset in Ubud. It was like this almost every evening! And I even miss the people, even though I was mostly on my own. I will never forget walking down the small winding streets of Ubud, being careful not to step on the little flowers and things the locals put out to keep evil spirits away. And the smiles of those old men and women just sitting there on the sidewalks, in the sun, apparently not doing much but being very happy nevertheless. I still get very moved when I think about it. And it makes me think about what we’re all doing, and why. And how it seems that in some places of the world, just sitting on the sidewalk with not much going on makes for an excellent life, where in other parts it is considered the opposite. So, when I say that I miss the people what I think I really mean is that I miss the reminder that it is perfectly possible to be very happy with very little. A bit of sun and a bit of belief goes a long way. But this is also the thing, I think. Because since Bali has become something of a hotspot for tourists and digital nomads, the locals have started to see how other people have it. So the thing with the sun and the belief that went a long way seems to be something that’s about to fade. …And that the grass is always greener on the other side. So you better not think about the other side. At all. Anyways, so what this means is that some of the indigenous people of Bali now seem to want some of that “riches.” And some want to obtain it in a bit of a shortsighted fashion. Two times I have landed at the airport of Bali. Two times I have felt robbed by the taxi drivers, asking for a fare that rivals the one in New York. Or how does $20 sound for a 15 minute ride? In a place where the average monthly salary is $200? And the fact that you can’t take money out of the ATMs without being afraid of having your card scammed. Which happens way to often. And careless bag-snatchings on scooters where the victims, also on scooters, often crash, and sometimes in a fatal way. And the list goes on, unfortunately. And this is also why I am having mixed feelings about Bali, and why a thought of booking a ticket also comes with the thought of devising a plan to get out of the airport in one piece. 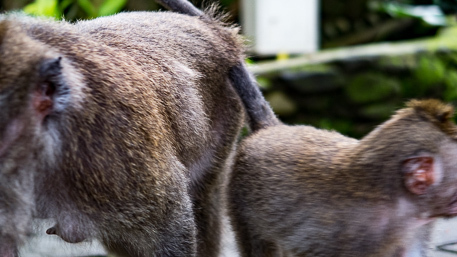 Am I pointing the finger at the “evil” people of Bali? And not at the tourists and digital nomads for “ruining” the place either, as some people will have it. While it doesn’t excuse crime, I think what has happened here is something very human. It is coded in our DNA to look to improve things in the ways we think we can. And when we find out about how a life could be lived, we may start to think that life is better. That the grass is indeed greener on the other side, and that you deserve some of that greenery. The nature alone is enough to make me want to live there again. And I would like to be able to say that what I miss the most is the traveling itself, but there really is a certain something to this place. Or maybe it’s just that it’s paradise, if you know where to look.